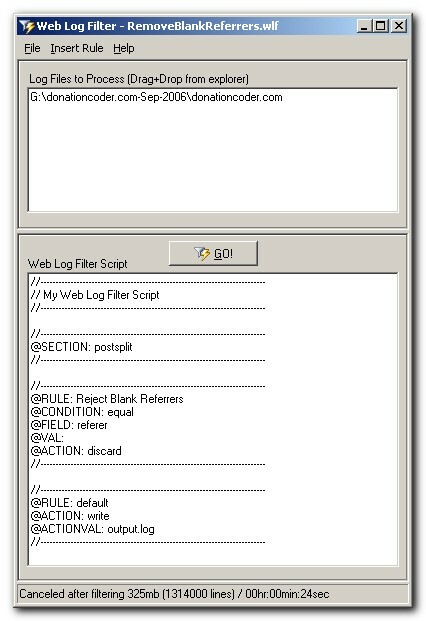 Web Log Filter is a helper utility for people who have huge (Apache) web log files, over a gigabyte in size, and want to be able to analyze these logs in standard web log analysis tools. Web Log Filter runs simple scripts that will rip through a log file at blazing speed and extract just the lines you care about (discarding the rest) and create one or more new log files, which are smaller and more manageable. ...... and then run so slowly as to make you want to slit your wrists. Web Log Filter runs simple scripts that will rip through a log file at blazing speed and extract just the lines you care about (discarding the rest) and create one or more new log files, which are smaller and more manageable. * You want to look at errors on your website; so you write a script to take a massive log file and create separate output log files for each different error code. * You want to prepare a web log file for a user on your website, so you write a script to extract all references to his set of pages. * You want to examine all outside referers to your website, so you write a script to discard all log lines with blank referrers or with referrers coming from within your own domain. * You want to look at search engine patterns, so you write a script to extract only log lines coming from google. Qweas is providing links to Web Log Filter 1.09.01 as a courtesy, and makes no representations regarding Web Log Filter or any other applications or any information related thereto. Any questions, complaints or claims regarding this application Web Log Filter 1.09.01 must be directed to the appropriate software vendor. You may click the publisher link of Web Log Filter on the top of this page to get more details about the vendor.